Roadside attractions can be found all across the United States and even around the world. 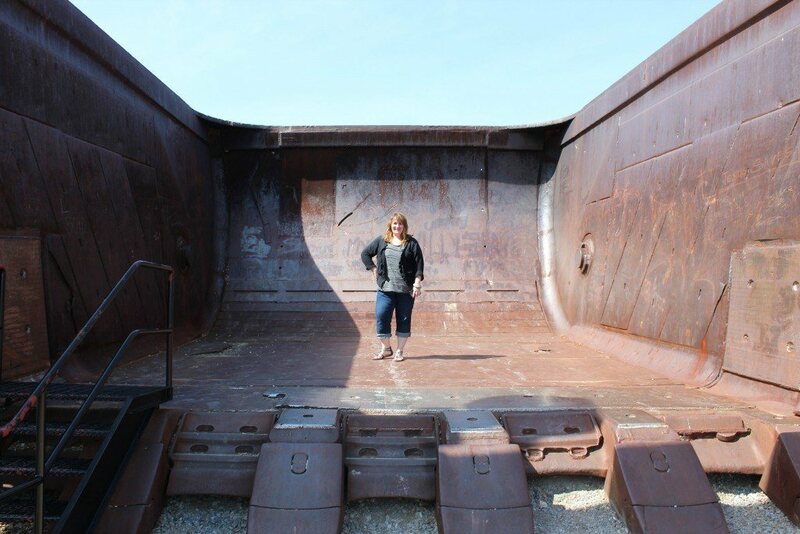 They range from single attractions like a giant can of paint, to a collection of classic Cadillacs partially embedded in the ground, to unique museums like the Oz Museum in Wamego, Kansas. 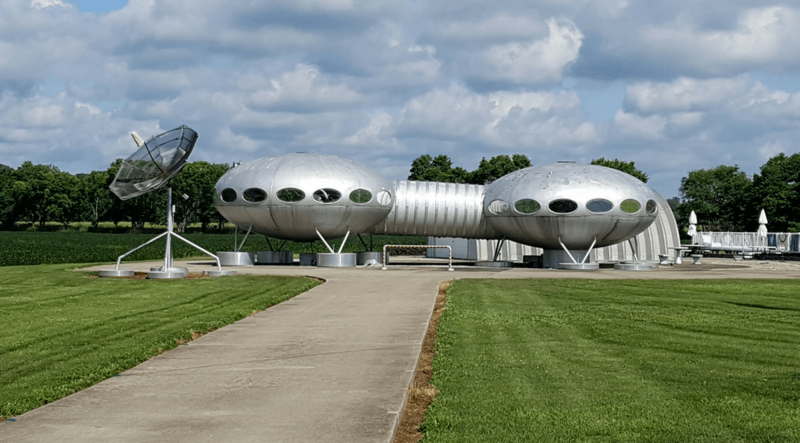 It doesn’t matter where your road trip takes you, you’ll find plenty of roadside attractions waiting to be explored and the Buckeye State is no exception. 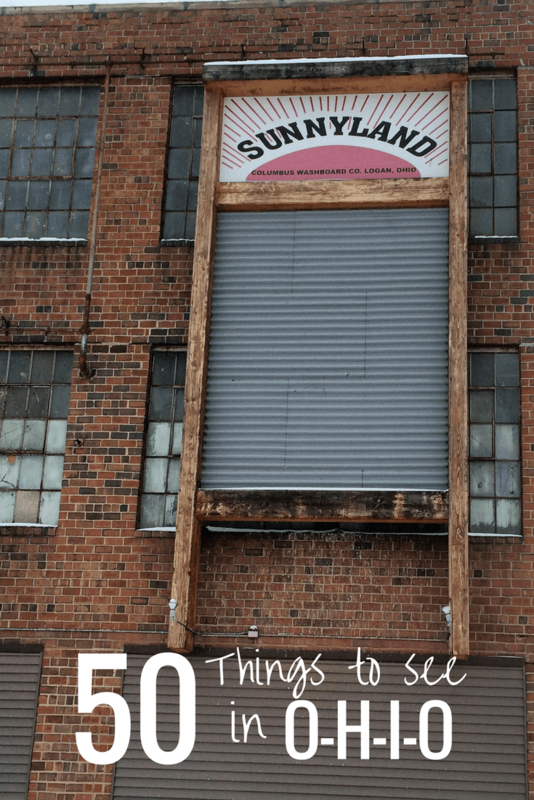 Here is a list of some of our favorite quirky things to see in Ohio. A walking, talking robot manufactured by Westinghouse for the New York World’s Fair. Elektro shocked the world by smoking a cigarette as it crossed the border into Canada. You can see this attraction at the Mansfield Memorial Museum in Mansfield, the oldest museum in Richland County. Other displays in this regional museum include local aviation and military history and a rare collection of Victorian anthropomorphic scenes, animals that are stuffed and dressed depicting various scenes. Hours: Saturday 10 a.m. to 4 p.m. and Sunday 12 p.m. to 4 p.m. 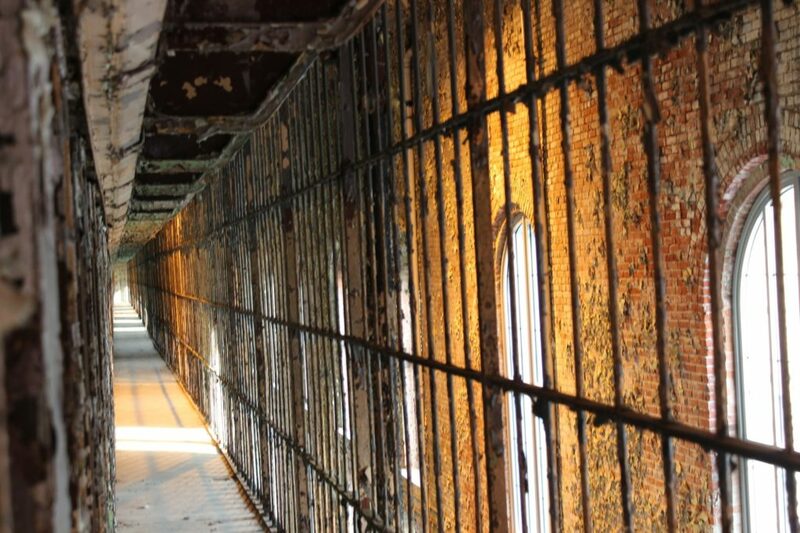 The world’s longest free-standing jail cell is in the Ohio State Reformatory in Mansfield. Located within the Ohio State Reformatory this jail cell contains 600 different cells for its inmates. Not only can you walk alongside the free-standing jail cell you also have the option of entering one of these supposedly haunted rooms and for the very brave (or crazy) spending the night in this haunted attraction. Guided and self-guided tours are available. Hours: Vary by season. April to September 2, the hours are 11 a.m to 4 p.m, 7 days a week. Visit the website for additional information. 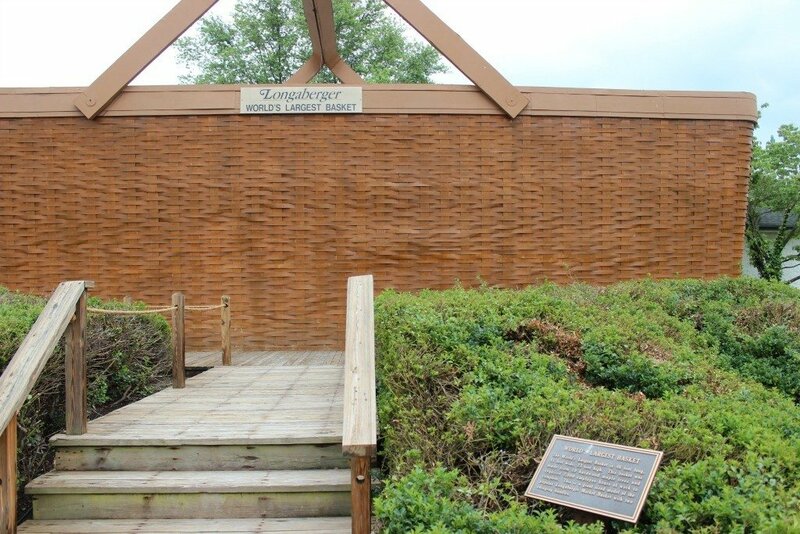 The apple basket can be seen at Longaberger’s Homestead in Frazeysburg a short distance from the World’s Largest Basket building outside Newark, and the World’s Largest Market basket in Dresden. The world’s largest market basket is the size of a small house. This basket is as large as a small house and took over 2,000 man hours to weave. Also part of the Longaberger legacy, it can be seen in Dresden. 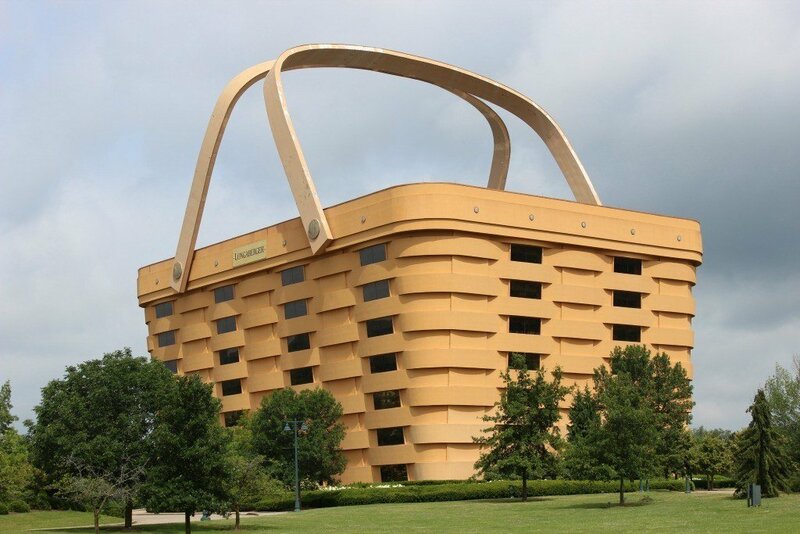 The world’s largest basket building is not open to the public but does make a fun sight to drive past. A replica standing at 160 times larger than Longaberger’s Medium Market Basket, the World’s Largest basket is an eye opener as it is the former home office for the Longaberger company. Learn how Cleveland became the home of Rock and Roll in this museum that gives music lovers a chance to see and hear a collection of music history throughout the decades. 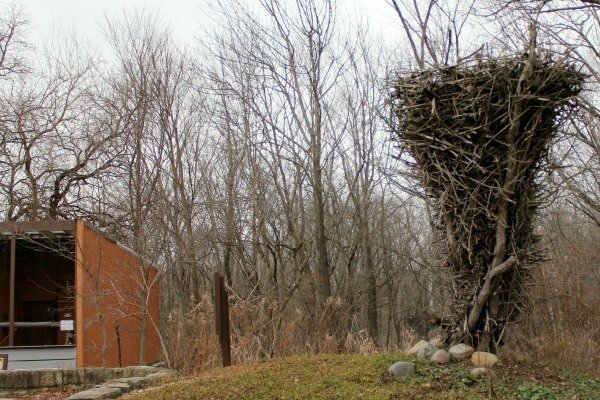 The World’s Largest Eagle’s Nest Replica can be seen at the Raptor Center in LaGrange. Learn more about our nation’s bird while viewing a replica of a nest that stood 12-feet deep and weighing over 2,000 pounds. 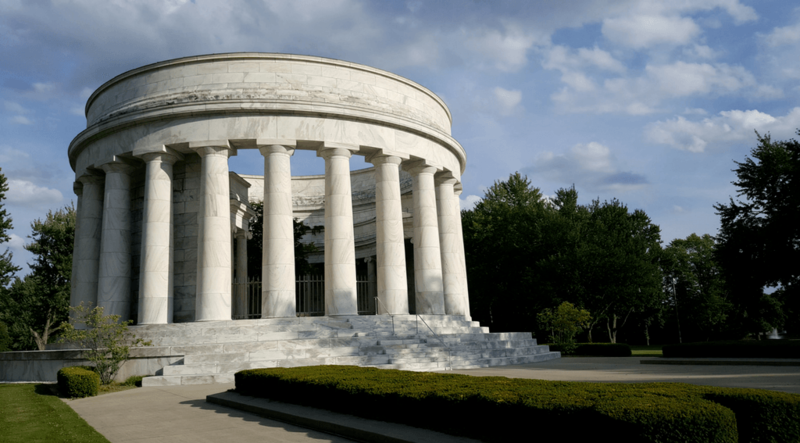 At this roadside stop, you can see Grecian columns surrounding the tombs that hold President Warren G. Harding and his wife Florence Harding. History buffs can step inside the graveyard across the street to see where his casket was originally entombed and to see the grave of his mistress. The Harding Home, made famous for the President’s front porch campaign during his run for office. In hopes of becoming an economic center, this small hidden town takes the name as The Center of the World. Look quick so you don’t miss it. Open year-round, The Christmas Story house is available for tours and even overnight stays. It is The original setting for the filming of the famous movie “The Christmas Story” with a museum across the street containing original memorabilia. Containing 78 scenes and over 300 wax figures, Ohio’s only wax museum is a new way to see the Holy Bible come to life. What once was once the World’s Largest Earth Moving Machine is now just the remaining metal bucket that can hold two school buses side by side. The bucket rests on a valley of a previous mine known as “Re-Creation Land”. Located in the heart of Cleveland this sculpture was created in 1995 to represent politician’s of America. With moving parts that seem to never go anywhere this large sight is one you can’t miss. Standing at 28-feet-tall and 48-feet-long, the World’s Largest Rubber Stamp states the word “FREE” across the front located two blocks from the Rock and Roll Hall of Fame. As it stands beautifully structured and intricately designed the memorial of our 20th President provides a different outlook on American history. It also holds the only Presidential casket that is on display to the public. 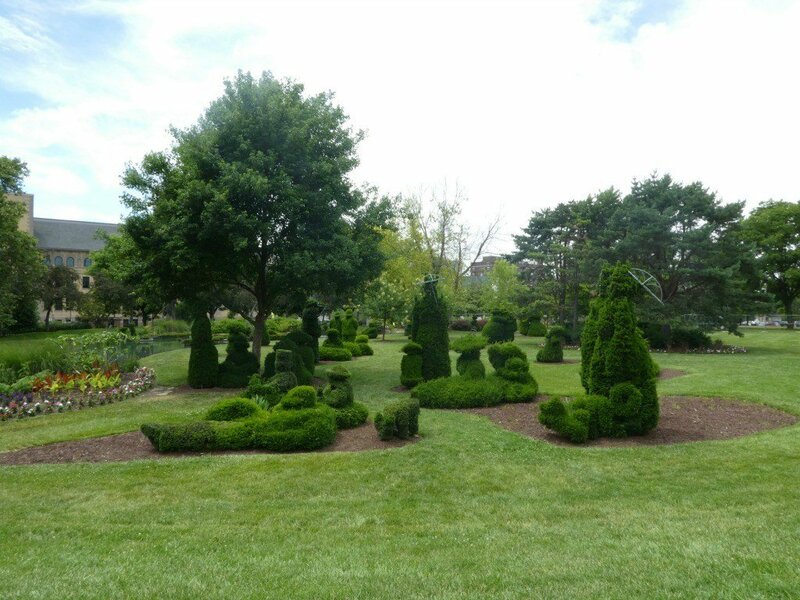 A work of art that is as large as life; the Topiary Park in Columbus is an artist’s vision using plants of all types to create a masterpiece you can walk through. Open all year round this park shows its beauty through nature along with events held by the community. 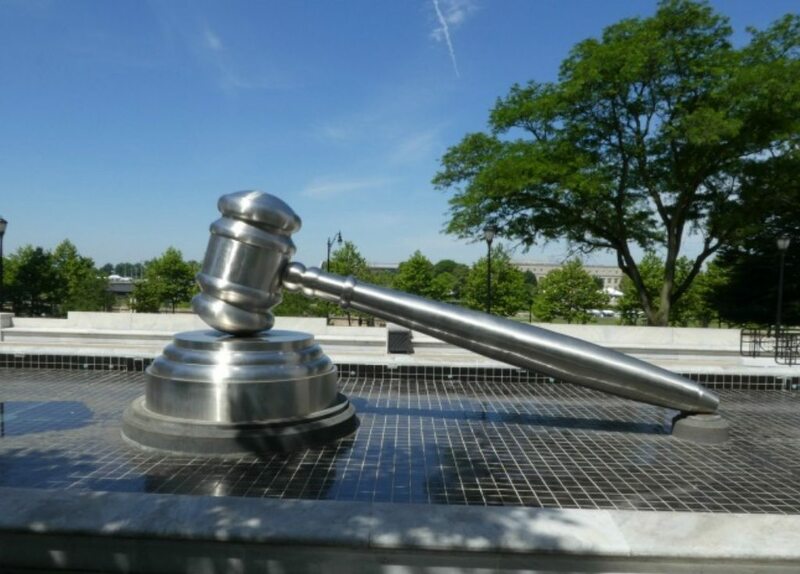 Placed in between two justice buildings this stainless steel gavel stands tall on top of a crystal clear reflecting pool for all to stop and view. 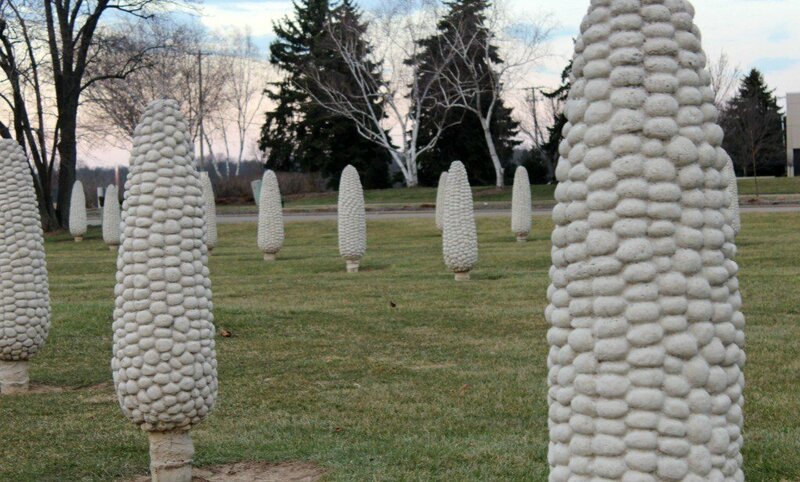 In honor of Sam Frantz, the creator of hybrid corn seeds, this attraction sprouts 109 larger than life sized ears of corn. 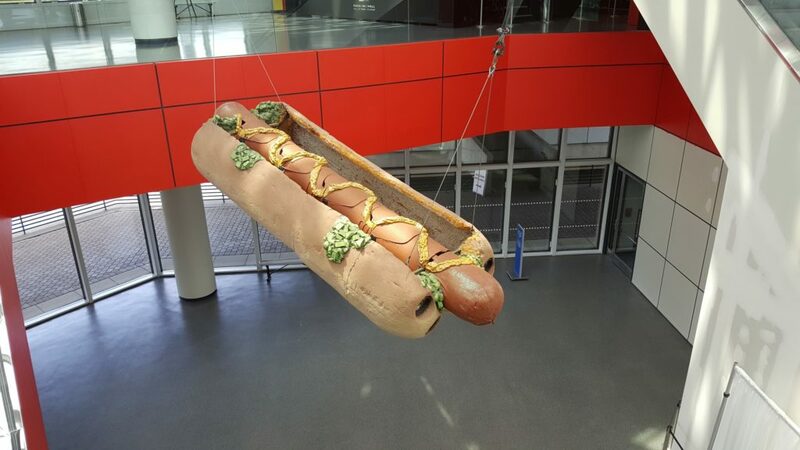 This creates a weird but exciting sight for those driving past. 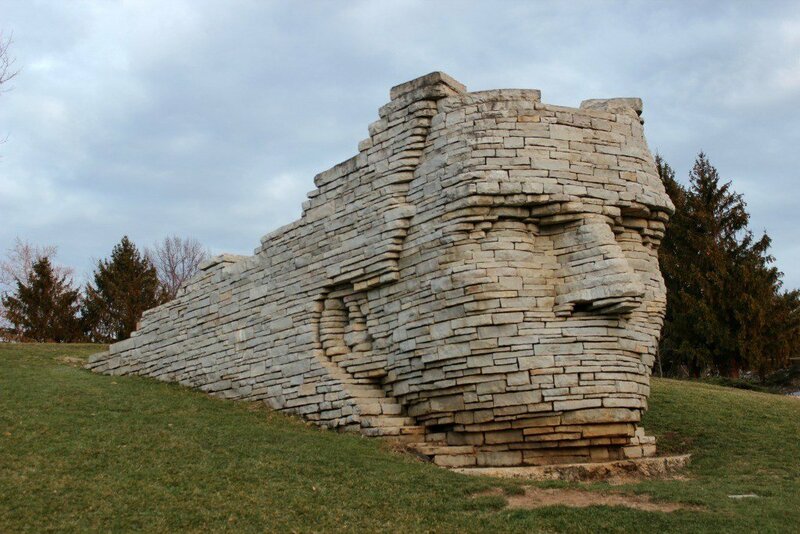 This monument represents the great Wyandot Indian Chief., made completely out of native limestone slabs. Visitors to this 12- foot tall portrait are able to stand on top of the attraction to capture a memorable photo. With 3,479 different pencil sharpeners on display, The Pencil Sharpener Museum is a place for tourists to stop and view this large collection. A statue that has stood tall for decades, Handless Jacques was once the front line attraction for “Jacques Sandwich Shoppe”. But after a long history lost his hands along the way to his current home not far from the shore of Lake Erie. This natural destination is located on Kelleys Island. Surrounded by other Kelleys Island natural spots and trails. 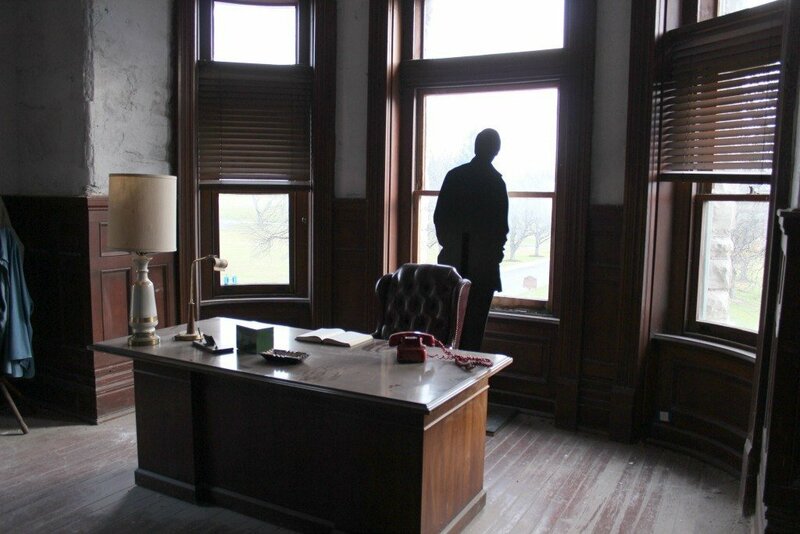 Take this trail across the Mansfield area to get a chance to step right into the movie “Shawshank Redemption”. There you will be able to see and visit many places that were used in the original filming. The World’s Largest Amish Horse and Buggy is a great photo op moment when touring the Amish community in Trumbull County. Its size is proportional to an actual horse and buggy, and the horse even has a name! Completely submerge into the Amish culture and retrieve your money from an ATM that looks like a real life horse and buggy. 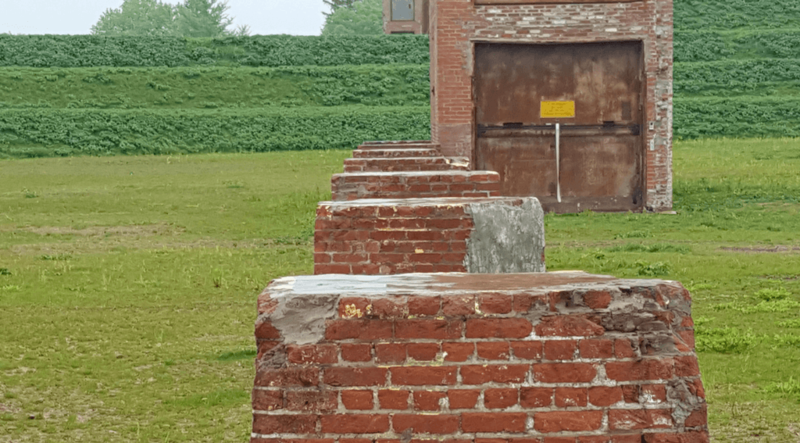 The remains of an old glass making facility turned park has incorporated the ruins from the factory as well as a nature preserve. An accidental discovery of this geode leads to a beautiful roadside attraction. Travel 40- feet underground for a chance to stand in the crystal cave. Take a look at the 352-feet of this Perry’s Victory & International Peace Memorial from down below or up above on its observation deck, just wait to visit until next year as the memorial is closed in 2017 for renovations. 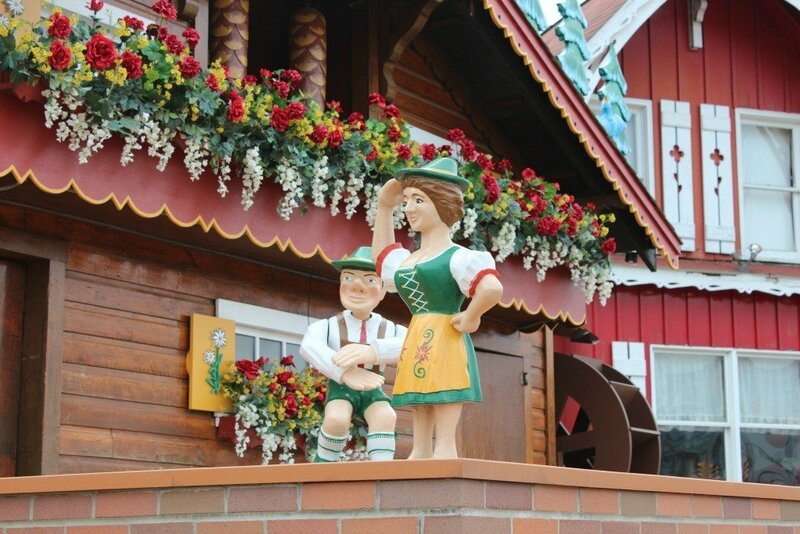 Listen carefully because every 30 minutes you will hear this giant 24-foot tall cuckoo clock put on a show with polka music played by a five-piece robotic band. 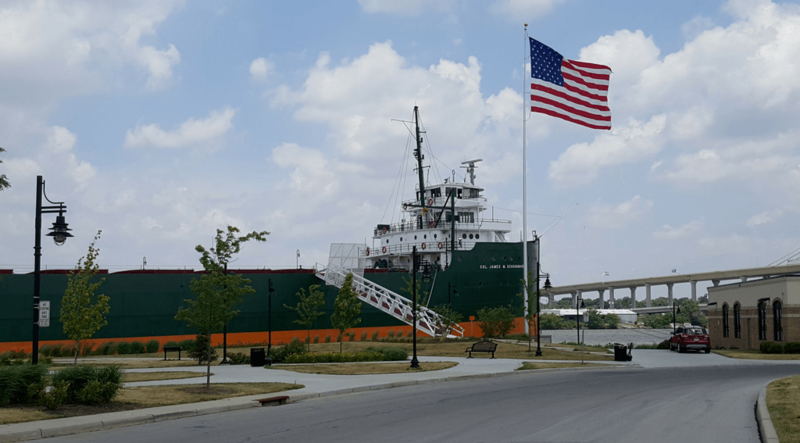 Take a step into the World’s Largest Freighter and take a self-guided tour through this once active ship. 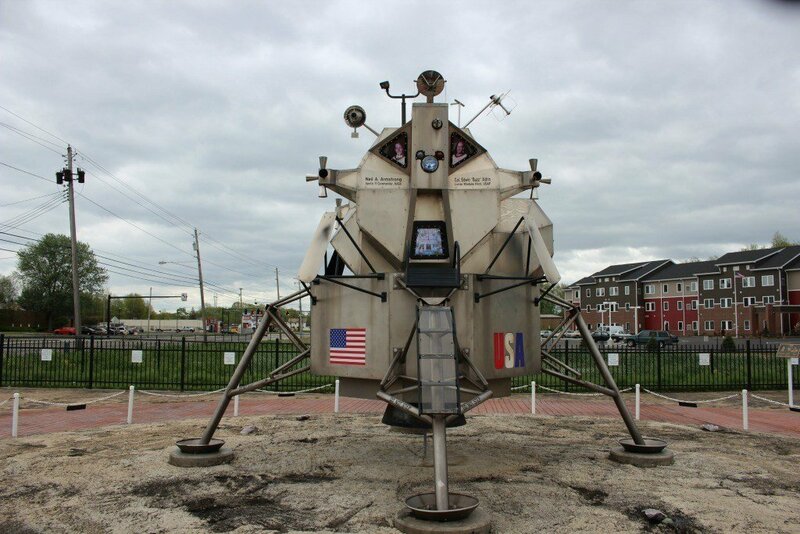 Travel to the spot where Neil Armstrong took his first airplane ride to find a mini park that represents the accomplishments Armstrong made when landing on the moon. Visit an alley dedicated to David Grohl, founder of Foo Fighters and former drummer of Nirvana. There you can see works of art dedicated to him and the World’s Largest Drumsticks. 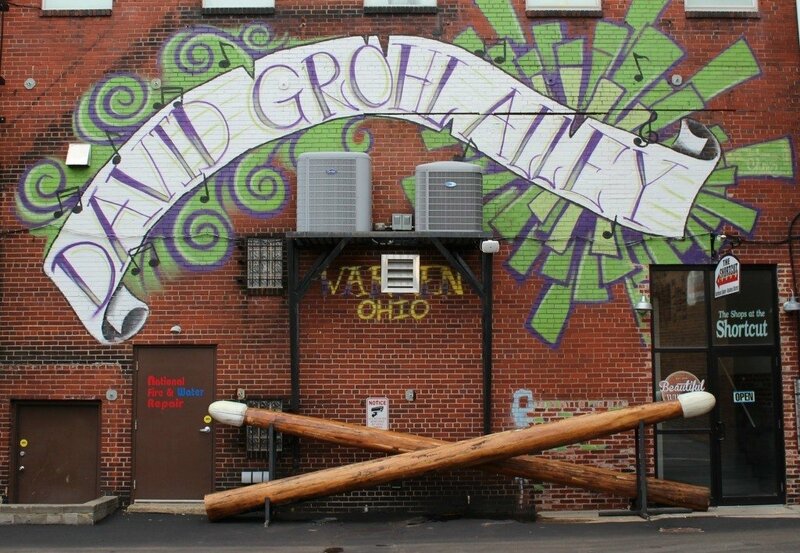 Address: David Grohl Alley, Warren, OH. Downtown, just south of W. Market St. and the Courthouse Square, on the east side of Main Ave.
Don’t blink around this sculpture known as the “Weeping Angel” or you may miss the black tears that drip from her eyes down to her neck. She gives off an unsettling vibe while being stunningly beautiful. 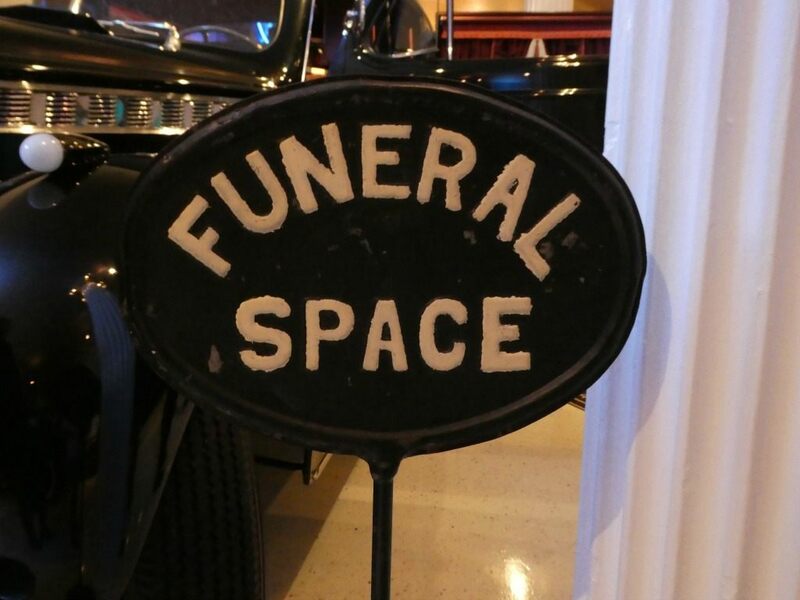 This museum contains a collection of hearses, caskets, and other funeral memorabilia from the late 1800’s to the early 1900’s. 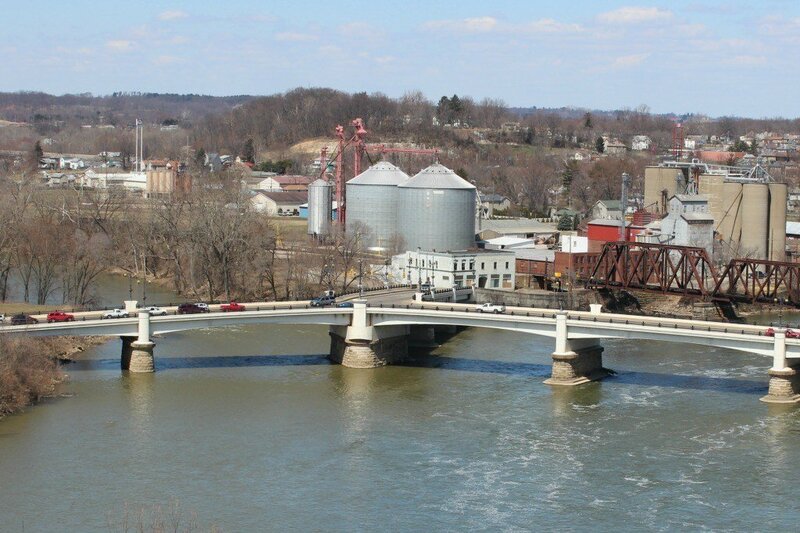 The Y bridge is an attraction you can drive across. It splits three ways, and flows across the Muskingham River. Address: Zanesville, OH 43701, Traffic carries of U.S. Rt 40 (Main st. and West Main st.) and Linden Ave. This average looking greenhouse and plant nursery takes a mystical turn as larger than life sized statues of nursery rhymes are spread throughout the building. This 5,200 pound granite ball balances on top of Charles Merchant grave since 1896 and seems to revolve mysteriously. While walking around the Lake View Cemetery in Cleveland take a few steps into the back to find where the Hanna Family placed a Welcome Mat leading to the family grave. 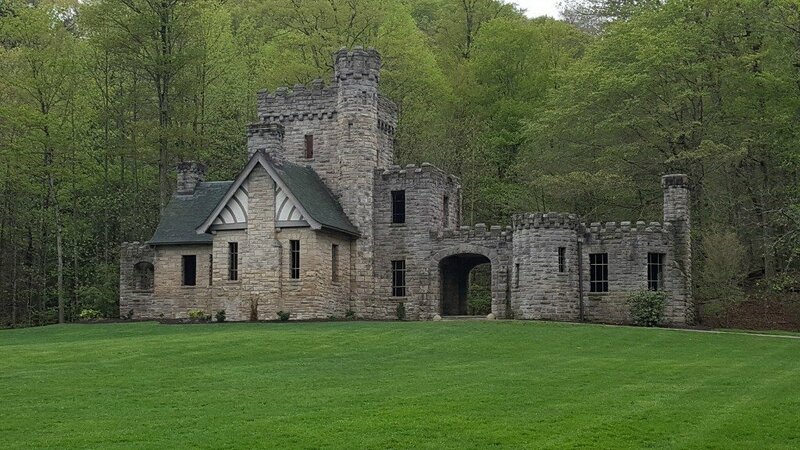 Get a sense of mystery in Squire’s Castle while learning about the urban legends of the family who once lived there. This castle is open year round with free admission. 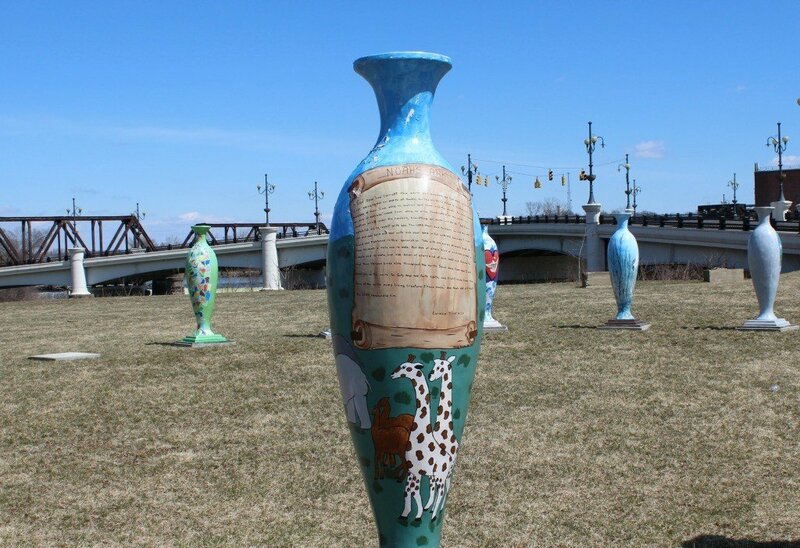 In honor of the now collectible Weller Pottery, artists of the town placed giant vases in a circular formation reminding its visitors of the famous Stonehenge. Try finding all one hundred vases spread across the town. Stop for a selfie in front of the World’s Largest Washboard and one can take a tour through the company’s museum, and even enjoy the washboard festival that is held annually. The water tower in Circleville, Ohio is painted to look like a large pumpkin hovering over the city. This eye-catching attraction is to promote the town’s annual Pumpkin Show. 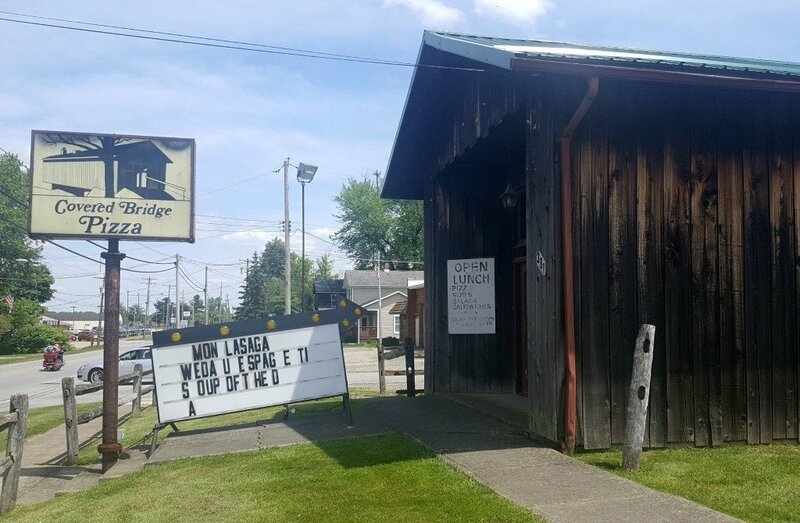 Get a slice of pizza in this unique pizza parlor that was once the Foreman Road Covered Bridge. What was once the home of two real-life giants, Seville now is the town known to carry their history. Seville now holds the graves of these almost 8- foot tall giants, their former home (private residence), and even a giant chair you can sit in for a perfect photo opportunity. Look closely on top of one of the Smith Dairy twin silos for a replica of a two-ton cow defying all odds as she stands proudly over the city of Orrville. Learn more about our nation’s Air Force with a tour of this free museum that provides many galleries, exhibits, and even plane simulators. 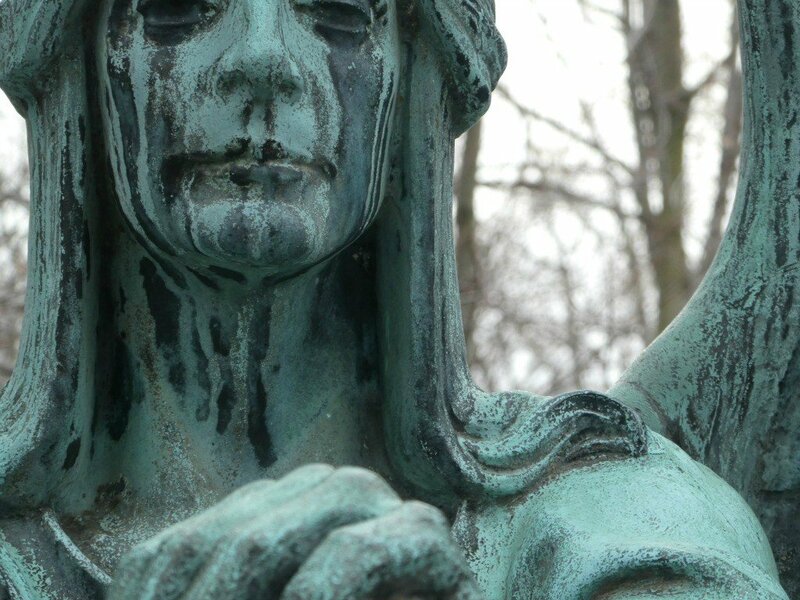 A walk up 108 steps to the beehive-shaped grave leads visitors through beautiful bronze doors where President William Mckinley and his wife, Ida, lay to rest. The tomb stands close to the McKinley Museum where travelers can learn more about the president’s history. Castle Noel holds the magic of Christmas with different memorabilia from famous movies such as The Grinch, Elf, The Christmas Story and Cousin Eddie’s Rv. A fan favorite is the red slide tourists can go down that is replicated from the movie The Christmas Story. Step back into time as you learn about technology systems from the 1920’s up to the 1950’s when color television was finally introduced. This currently lived-in house stands as one of the more interesting examples of architecture. Standing as two silver saucers joined with connecting tubes in between, this house may not be open for public viewing but is worth a drive by. 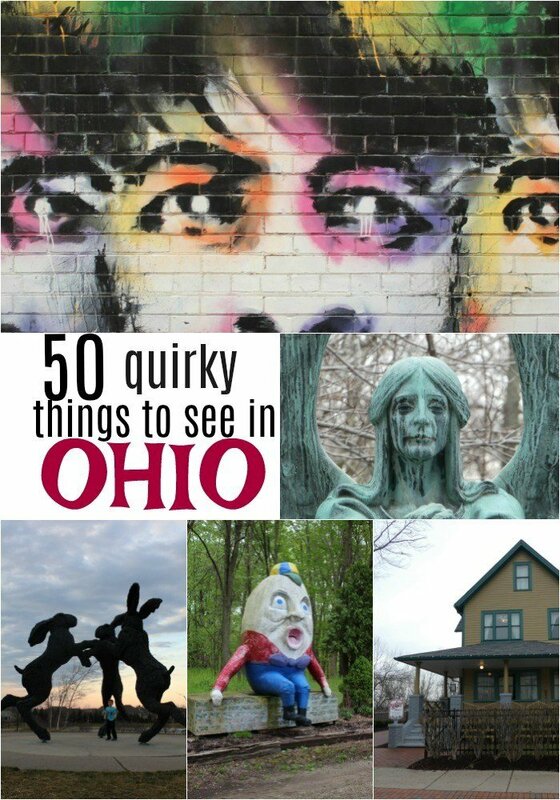 Which one of these quirky things to see in Ohio would you like to visit? These are quirky but fun. 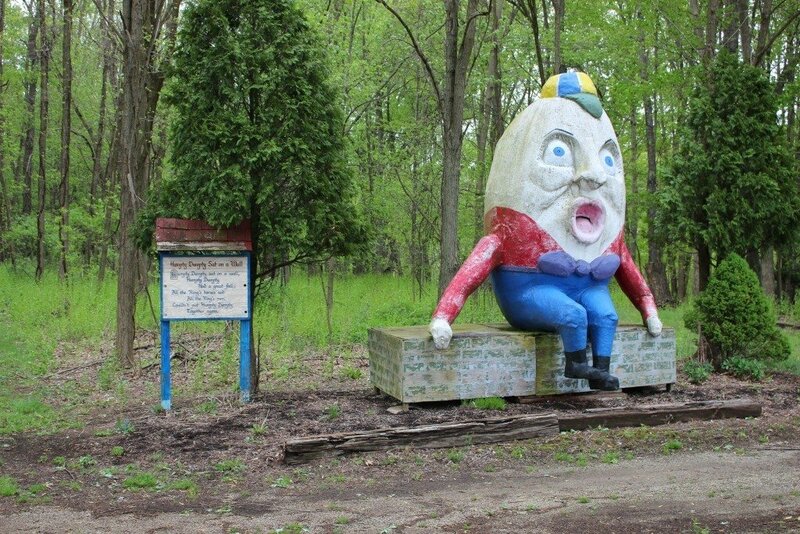 I really want to take a picture sitting next to Humpty Dumpty and pretend to fall. ? 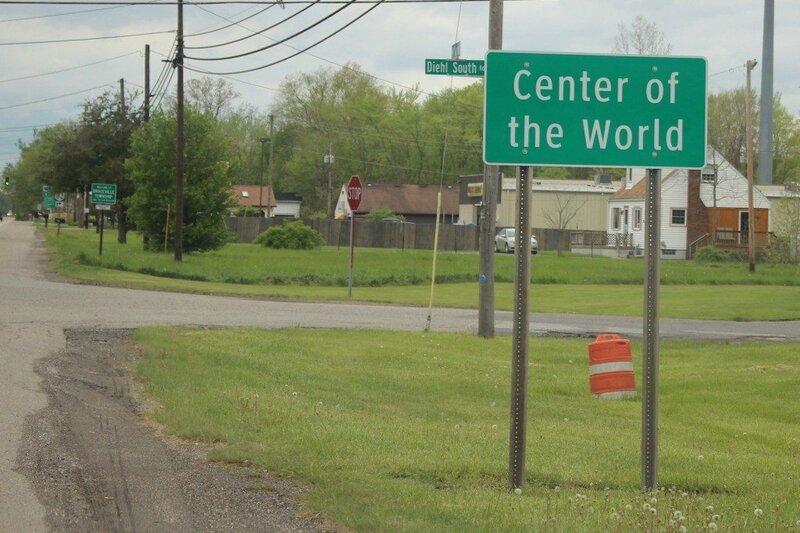 How fun that the center of the world is in Ohio! Because there’s a town called Felicity, CA that touts itself as the Center of the Universe! It has a pyramid, a small church, a gift shop, a tiny post office, and a small restaurant. And that’s it! Oh, and they have an old section of the Eiffel Tower staircase. Haha! Yes, I’m sure it does. I tried to find this cuckoo clock and was unable. Is it still there or did I just miss it? Hi Jill, The cuckoo clock is still there. You’ll find it at 100 N Broadway St, Sugarcreek, OH 44681 as you pass through town. It’s definitely worth the stop. I hope you’re able to visit another time and have better luck spotting it.